Dr. Balsai was elected Judge of Constitutional Court by the Hungarian Parliament in June 2011, with the effect from 1st September 2011. 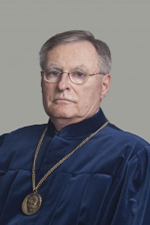 He studied law between 1967 and 1972 at the Faculty of Law of Eötvös Lóránd University in Budapest. He was studying for the bar from 1972 until 1974, and after having qualified as a lawyer in 1974, as member of the Chamber of Barristers of Budapest he worked for a year at a law office, and between 1995 and 2007 he worked as a private barrister. Between 1990 and 1993 he was Minister of Justice in the József Antall government, between 1993 and 1994 he was Minister of Justice in the government of Péter Boross. From 2003 until 2004 he was Parliamentary Observer of the European Parliament, since 2004 he has worked as Member of the European Parliament. He was member of the Committee on Constitutional Affairs and of the Committee for Petitions of the EP. He was continuously Member of the Hungarian Parliament from 2 May 1990 until 1st September 2011. His major duties were: member and vice-president of the Committee on Constitutional, Administrative and Procedural Affairs, many times chairman of the same Committee, member of the Committee on Drafting of the Constitution and of the ad hoc Committee on Drafting of the Constitution between 2010 and 2011. More times he was member and vice-president of the Inquiry Committee on Immunity, Conflict of Interests and Mandate, and of the Committee on Human Rights, Minorities, Civil and Religional Issues. He was leader of the faction of MDF (Hungarian Democratic Forum) between 1998 and 2002, and vice leader of the faction of Fidesz (Alleance of Young Democrats) between 2010 and 2011.